Once the technicalities are ironed out over the third and fourth units, negotiations over the fifth and sixth units of KNPP are not seen as problematic at all. 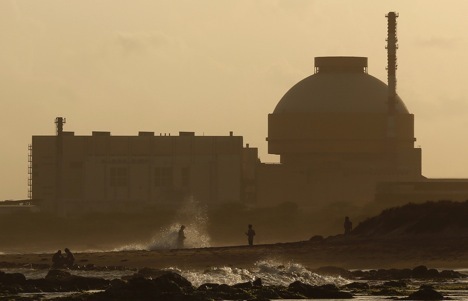 India and Russia have almost finalized negotiations on the third and fourth units of Kudankulam Nuclear Power Project (KNPP) and hope to sign the agreement "within weeks" and have agreed "in principle" to sign an agreement on the fifth and the sixth units separately at a later date. A key Indian official, involved in the thick of India-Russia bilateral relations architecture, said that both sides are confident that they will be doing four more KNPP units together. However, the official clarified that the current negotiations pertain only to the third and fourth units. Indian officials are still maintaining utmost secrecy in giving a specific timeline ofwhen the agreement for the third and fourth units will be signed and whether Indian Defence Minister AK Antony will be doing the honours and ink the deal with his Russian interlocutors during his upcoming Russia visit (November 15-17). There is a strong possibility that the agreement on the third and fourth units may besigned between the Nuclear Power Corporation of India Ltd (NPCIL) and its Russian counterpart agency. Well informed Indian sources have said that once the third and fourth units become a done deal, this would be a battle more than half won and would make things easy for not just the fifth and sixth units of KNPP but several more nuclear reactors that the Russians would be installing in other parts of India. The fact that Indian Prime Minister Manmohan Singh and Russian President Vladimir Putin actually could not sign the agreement for the third and fourth KNPP units during the 14th Indo-Russian annual summit in Moscow on October 21 should not be construed as a "failure"; these sources said. The fifth and sixth units of KNPP are not seen as problematic at all. The importance of the ongoing negotiations for the third and fourth units flows from the fact that this is the first deal with the Russians or with any nation for that matter since the Indian nuclear liability laws came into place a couple of years ago. But there is no doubt that the Russians are going to build four more, not just two,nuclear plants at KNPP in Tamil Nadu. Indications to this effect have been given by none other Putin himself – and that too on record! Putin made a press statement after the talks while Manmohan Singh was seated by his side. "Let me mention our biggest achievement too: in July, operations began at the Kudankulam nuclear power plant's first unit, "Putin said. "It is being linked up to India's energy grid now, and indeed, I think this will happen literally in the next few hours. The second unit is in the works now, and there are plans for building more units, perhaps four more." On its part, India has walked a mile to assuage Russian concerns on its civil nuclear liability law and proposed to Moscow that their liability in case of anaccident will be kept limited to the suppliers' default. This formulation seems more or less acceptable to the Russians. The writer is a New Delhi-based journalist. His Twitter handle is@Kishkindha.